Fort Pierce, Fla. – June 21, 2018 – The Navy SEAL Museum now offers a SEAL Delivery Vehicle (SDV) virtual reality experience for guests. The interactive computer-generated software was graciously donated to the Museum by Mass Virtual of Orlando, Florida. The program incorporates auditory and visual feedback to simulate a realistic underwater SDV experience. From the initial launch at the mother submarine dry deck shelter into the open ocean, guests experience an authentic Navy SEAL mission along the ocean floor. 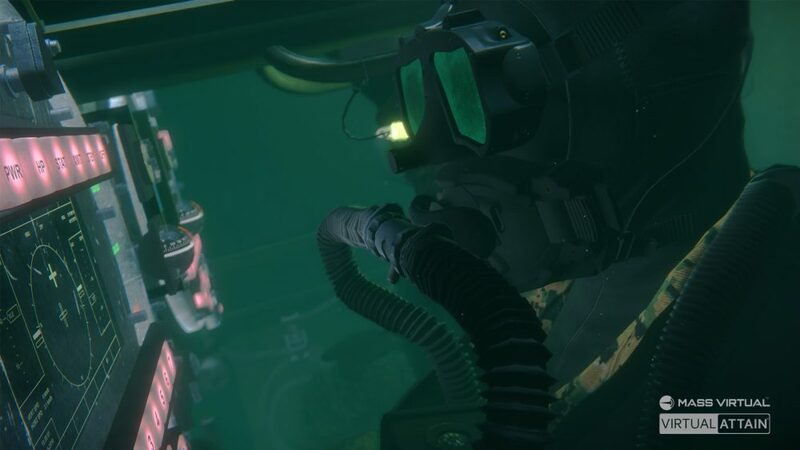 The two-minute program can be adjusted to mimic a nighttime mission, as it would be conducted in SEAL training or combat. Museum Assistant Executive Director Ken Corona, who served on SDV Team TWO out of Little Creek, Virginia for several years, acknowledges the accuracy of the new system. Mass Virtual creates various applications to aid and evaluate [commercial and] military training. The company donated the software to help educate Museum guests by immersing them in a realistic SEAL operation. The SDV Experience is operable during select Museum business hours. Please call (772) 595-5845 in advance to confirm availability. Mass Virtual produces high-engagement, high-retention Desktop, Virtual, Augmented and Mixed Reality learning applications infused with sound instructional science. The mission of Mass Virtual is to provide customers with the most immersive, effective and affordable advanced virtual learning solutions. The National Navy UDT-SEAL Museum is the only museum dedicated solely to preserving the history of the U.S. Navy SEALs and their predecessors. Located in Fort Pierce, Florida, the Museum resides on the training grounds of the original Navy combat swimmers, the Frogmen. Built to honor the men who served with fortitude and ingenuity, the Navy UDT-SEAL Museum first opened its doors on Veterans Day in 1985. From humble beginnings, the facility has experienced tremendous growth, achieving national stature in 2007. The main objective of the Museum remains the promotion of public education by providing the opportunity to explore the history of the Navy SEALs through interactive exhibits, while honoring the fallen at the SEAL Memorial and caring for those warriors’ families through Trident House Charities. For more about Mass Virtual, visit www.massvirtual.com.